A group viewing the location of a potential off-channel reservoir at Wolf Creek that would be filled with water from the White River. The reservoir would be in the visible gap across the White River, located about halfway between Rangely and Meeker. RANGELY: The economic feasibility of building an off-channel dam and reservoir next to the White River between Rangely and Meeker at a cost of $119 million to $191 million was questioned Wednesday night at a meeting in Rangely. 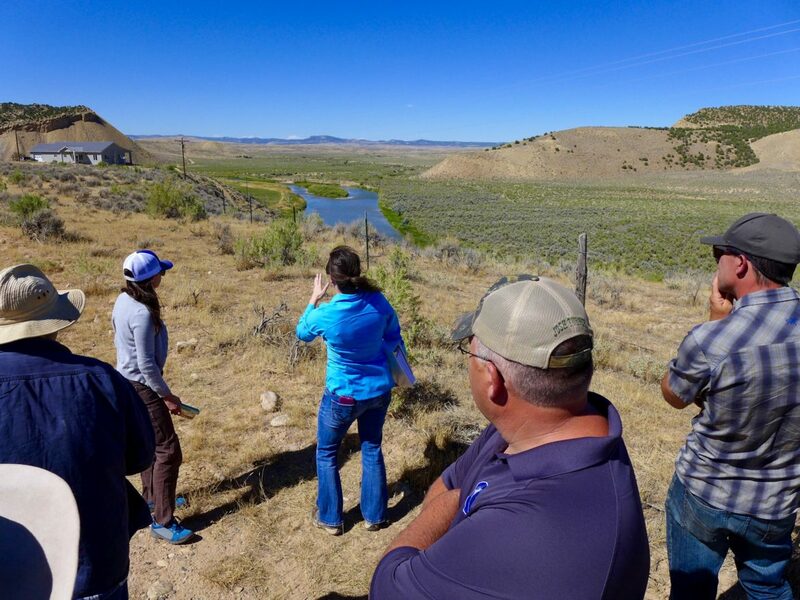 Earlier in the day Gray had toured the potential reservoir site, where the dry Wolf Creek basin joins the White River valley, about 23 miles upstream from Rangely on Hwy 64. Brad McCloud, a senior project manager at EIS Solutions representing the Rio Blanco Water Conservancy District, responded to Gray’s comments on Wednesday, emphasizing that the ultimate size of a reservoir will be shaped by demand for the water from entities who are willing to spend money on the project. Editor’s note: Aspen Journalism is collaborating on coverage of rivers and water with the Steamboat Pilot, The Aspen Times, the Vail Daily, and the Glenwood Springs Post Independent. The Steamboat Pilot published this story in its print edition on Sunday, Sept. 16, 2018. Note: this article was corrected. It’s Brad McCloud with EIS Solutions, not Brad McCall.